Today, just as a little game, we are going to imagine that we are manufacturers of water pumps. That’s a good old boring b2b product if ever there was one. Let’s imagine you had a magic wand and you could ask it to improve your water pump in any way at all; what would you ask for? Would you ask it for more power so it could pump more water? But why would you do that? You have a pump which is fit for purpose and it pumps the required amount of water per hour every hour. A pump with greater capacity would be no advantage. What about asking the magic wand to improve the build quality of your pump? Possibly. However, the pump is already highly reliable and it lasts at least five years. A better quality pump would cost more and it might only last six years. Would people pay for that? Maybe a 10% improvement in quality would enable us to get a 10% increase in price. Improved quality is something that we could think about because it is nice to have. Now, what about asking the magic wand to give the pump some intelligence? We could ask it to inform us well in advance if there is a problem. We could ask it to adjust automatically to different flow rates. We could ask it to be linked to our smart phones so that we could get a reading on how much it has pumped in the last 24 hours. Small though these things may be, they would make the pump very different to those offered by the competition. They may even excite a few customers. They would definitely make our product stand out as different and innovative. It is these sort of questions that Noriaki Kano, a professor of quality management at the Tokyo University Of Science in Japan was thinking about back in 1984 when he invented his model for analysing what attributes of products are valued by customers. His tool has two axes. 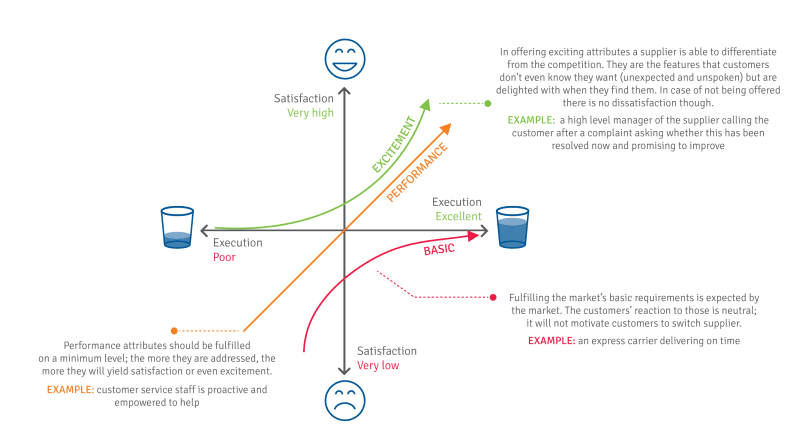 The vertical axis measures satisfaction in the attribute where low satisfaction is at the bottom and high satisfaction at the top. The horizontal axis measures the degree to which the product delivers against the function which is expected. Poor function or execution of the products is at the left-hand side and excellent execution or implementation of the product is at the right. You now can see these three attributes we have been talking about with the pump. Quality is a performance attribute so that if it improves in its execution, it will deliver a proportional improvement in satisfaction. Speed of pumping is a basic attribute. We expect the pump to move a certain number of litres of water per hour and it is no benefit to us if it exceeds this amount. If our pump didn’t meet this level of output no one would buy it and if we make it more powerful no one will pay more for it (at least in the application for which it is being used). Those little improvements or innovations in the intelligence of the pump are the things that could excite people. They are the things which would make our product very special and if we got them right, it would be world-class. The marketing guru, Peter Drucker, once said “Because the purpose of a business is to create a customer, the business enterprise has two – and only two – basic functions; marketing and innovation. Marketing and innovation produce results; all the rest are costs.” Next time you are carrying out some new product development, consider Kano. His model will tell you which innovation is worth thinking about.